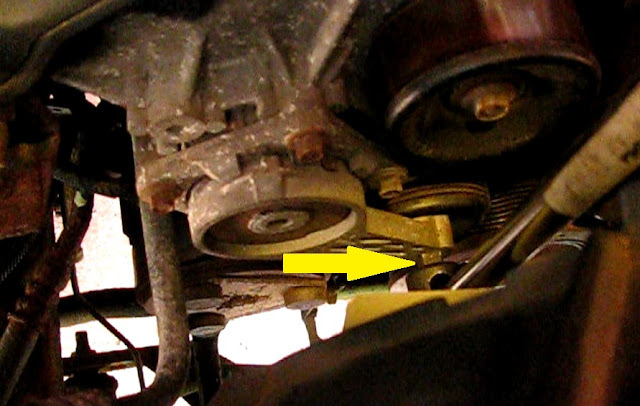 This post covers removing and installing the serpentine belt on a 5.4L Ford F150. The method I use involves finding a means to hold the tension off the belt in order to make removal and installation easier. This enables one person to much more easily perform this sometimes frustrating job. Tools: 8mm socket and 3/8" ratchet. breaker bar, 14mm wide tool to lock tensioner bar. 2) Remove the throttle body cover. This is needed to get the air intake assembly out of the way. 3) Remove the air intake assembly. 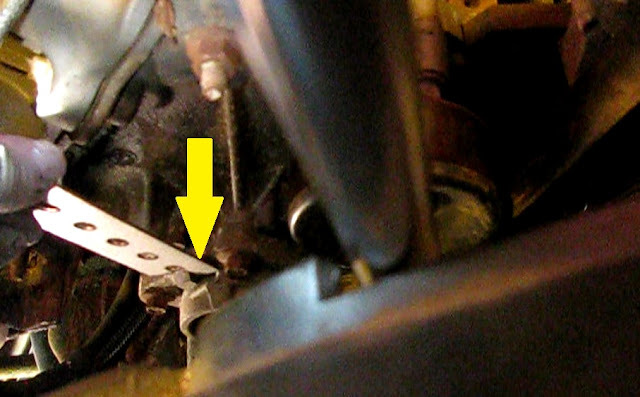 Loosen a hose clamp at the throttle body with an 8mm socket. Unsnap the clamp at the other end of the assembly and set the air intake aside. 4) With a tool or metal piece 15mm wide at the ready, insert a 1/2" square drive breaker bar, the longer the better, into the square opening on the arm of tensioner. Turn the bar clockwise and when at end of travel stick the metal piece in the gap created above the tensioner. Now the tension is held off the belt. 1) Start with the whole belt looped above the water pump and then thread it between the tensioner and the upper idler. Enlarge the loop and place it over the AC compressor. 2) Now make another loop and thread it between the idler and crank pulley. Enlarge and seat it on the crank pulley. 5) Install the throttle body cover. Thank you... actually thought my engine seized. Tried to sell the truck (loaded 1999 expedition in excellent shape) to a mechanic for $750. No interest in a truck with a blown engine. Then decided what the heck, I'll repair replace the engine myself. A few rabbit holes later I discover the ac pulley froze... took off the serpentine belt and the darn thing turned over. i couldn't stop smiling! Anyway. you are by far, the most concise explanation of getting the new belt on on the net. Thanks!! Great. Glad you had such a good outcome and I'm happy my post helped!